Question More: Liberating Libya – Priceless? WASHINGTON, Nov 3 (KUNA) — The International Monetary Fund (IMF) on Thursday said it was meeting with leaders of Libya’s Transitional National Council (TNC) to determine the needs of the country. “There will be a meeting with the authorities shortly. I don’t have a specific date but it will be soon,” IMF spokesman David Hawley said at a news conference in Washington. The prosecutor for the International Criminal Court (ICC) says his office will investigate alleged crimes committed by NATO during the civil war and intervention in Libya along with those of the Gaddafi regime and the rebels. Luis Moreno Ocampo did not provide any details on allegations against NATO forces as he reported to the UN Security Council on Wednesday. The ICC will probe into war crimes allegedly committed by anti-Gaddafi forces, including persecution of civilians, killings of combatant captives and the death of the former Libyan leader himself, the prosecutor said. De NAVO zal Libië blijven ondersteunen bij de wederopbouw als het land dat wil. Dat maakte secretaris-generaal Rasmussen bekend tijdens zijn maandelijkse persconferentie. De NAVO beëindigde maandag de missie in Libië. Volgens Rasmussen zou de NAVO kunnen helpen bij het opzetten van een ministerie van Defensie. De Deen zei verder dat er nog geen officieel verzoek ligt van de Libische overgangsregering (NTC). De leider van de NTC, Mustafa Abdel Jalil, had de NAVO eerder gevraagd om missie pas aan het einde van dit jaar te beëindigen. Hij wilde dat de NAVO zou helpen om aanhangers van de gedode leider Kadhafi te beletten het land te verlaten. Rasmussen verklaarde nogmaals dat de NAVO in Libië “het juiste heeft gedaan, op de juiste manier”. Tijdens de maandenlange operatie in Libië zouden geen burgers zijn omgekomen en is de bijkomende schade door de acties van de NAVO beperkt gebleven. De hoofdaanklager van het Internationaal Strafhof in Den Haag, Ocampo, zei woensdag dat het Hof mogelijk oorlogsmisdaden van de NAVO in Libië gaat onderzoeken. The questionable activities of the Libyan rebels have become a subject of concern of Human Rights groups a long time ago. While the Gaddafi army was the one to blame for severe violations of human rights, the reports of such organizations as Amnesty International managed to break this stereotype. The leaders of Libya’s new government – National Transitional Council are describing their goals as an intention to build a modern democratic state, based on the values of “moderate” Islam. However the documented involvement of the Libyan militia in killings, abductions and torture hardly meets the standards of a democratic state. Now the issue of the militias has become one of the most serious challenges that Libya’s new provisional government is facing. Lots of independent brigades have spread around the country, creating an escalating threat of the internecine confrontations. The George Walker Bush and Barack Hussein Obama administrations share a fascination for displaying the dead bodies of their vanquished enemies. For Bush, it was the gruesome stone-slabbed corpses of Qusay and Uday Hussein, Saddam’s sons, after they were killed in a firefight with U.S. troops in. That was followed by the body of Sadaam after his hanging. THE installation of the National Transitional Council (NTC) government in Libya by the North Atlantic Treaty Organisation (NATO) could signal the beginning of an open neocolonial scramble for Africa. Suspicions about such a blueprint were first aroused when President George W. Bush set up the United States-Africa Command (AFRICOM) in 2008, months before demitting office. The demand for a permanent American military footprint on the African continent had come from right-wing think tanks that enjoyed great clout in the corridors of power during the eight years of the Bush presidency. A background paper prepared in 2002 by the influential right-wing think tank Heritage Foundation had called for the creation of a military command for the continent so that “direct military intervention”, using air power and naval forces, could become possible to “protect vital U.S. interests” in Africa. Such interventions, its authors wrote, would not necessitate the deployment of U.S. forces on the ground. Such wars, the paper proposed, should be fought with the help of local allies. The U.S. Defence Department’s African Contingency Operation Training and Assistance Programme is deeply involved in training the armies of many countries, including Ethiopia, Kenya, Uganda and Ghana, America’s close allies in the region. Even the most conservative estimates suggest that the war on Libya has led to the loss of at least 50,000 lives, mostly at the hands of NATO’s bombers and local allies. FROM Kabul in October 2001 to Tripoli in October 2011, a decade of unremitting planetary warfare has seen countries devastated and capitals occupied over a vast swathe of territory from the Hindu Kush to the northern end of Africa’s Mediterranean coast. Within the Arab world, this ultra-imperialist offensive of Euro-American predators may yet move on to Syria as well – and beyond that to Iran at some future date. For now, in any case, the occupation of Libya by the North Atlantic Treaty Organisation’s (NATO) clients and corporations marks the vanquishing of the spirit of rebellion that was ignited in neighbouring Tunisia and Egypt earlier this year and has been under attack ever since. For much of Africa, though, this may yet be merely a beginning of a new conquest by the Euro-American consortium that may ravage the continent even more ferociously than did the famous “Scramble for Africa” that was sanctified in Berlin at the end of the 19th century. The neocolonial scramble for Africa has truly begun with the installation of the National Transitional Council in Libya. 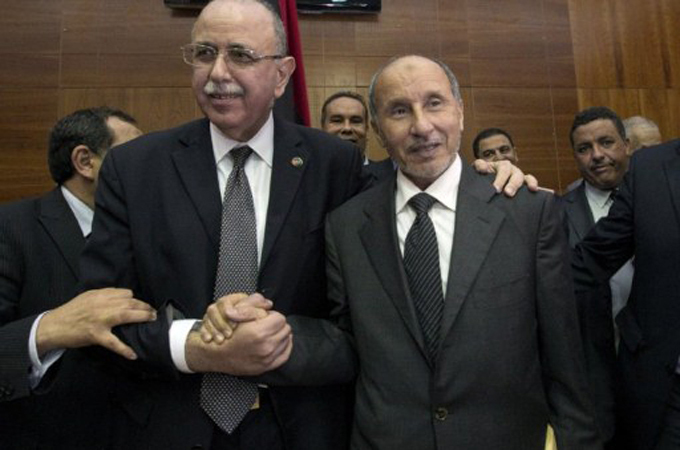 New Libyan “PM” is Big-Oil Goon. November 2, 2011 – Associated Press recently reported that Libya’s rebel militants have named a new “prime minister” this week. AP depicts the latest unelected Western proxy, Abdurrahim el-Keib, as a progressive academic who has spent decades in the United States teaching at Alabama University and leading the local Muslim community. Mentioned briefly as a “former employer,” however, is the Petroleum Institute, based in Abu Dhabi, Dubai and sponsored by British Petroleum (BP), Shell, France’s Total, the Japan Oil Development Company, and the Abu Dhabi National Oil Company. El-Keib is listed as a “Professor and Chairman” in his Petroleum Institute profile which also describes extensive research conducted by him sponsored by various US government agencies and departments over the years. Many of the local militia leaders who helped topple Col. Muammar el-Qaddafi are abandoning a pledge to give up their weapons and now say they intend to preserve their autonomy and influence political decisions as “guardians of the revolution”. The issue of the militias is one of the most urgent facing Libya’s new provisional government, the Transitional National Council. Scores of freewheeling brigades of armed volunteers sprang up around the country and often reported to local military councils, which became de facto local governments in cities like Misurata and Zintan, as well as the capital, Tripoli. Hundreds of revolutionaries fought each other at a hospital in Tripoli early on Monday, in the biggest armed clash between allies since the fall of Muammar Gaddafi. November 31, 2011 “The Telegraph” – Tripoli – The fighting fuelled growing fears that nobody is in control of thousands of swaggering armed men who are still based in Tripoli and that the country’s interim government will struggle to impose law and order. Two people died from bullet wounds and at least seven fighters were injured during a battle that started when militia from the town of Zintan were stopped by guards from the Tripoli Brigade from entering the city’s Central Hospital to kill a patient. As the decomposing body of Muammar Gaddafi was being buried in the sands of the Sahara last week, a fighter returning home from the Libyan war was busy in his garden. With a small spade, he dug a hole behind his house in Tripoli. Then, after kissing his beloved AK-47 automatic assault weapon, he wrapped the gun in plastic bags and placed the lot inside a pillow case, which he put in the ground and covered with earth. De hoofden van de Toeareg stammen hebben een oproep gedaan aan alles Libische stammen om een Jihad te beginnen tegen de huurlingen en hun leiders die het land hebben bezet. Dit nadat het bericht bekend was geworden dat hun hun Emir vermoord is. De manier waarop de man die door de media van de NAVO werd gepresenteerd als Muammar Al-Kadhafi mishandeld werd, heeft de wereld diep geschokt, dus stel u voor welke indruk dat gemaakt heeft op zijn broeders en zijn beste vrienden en de mensen die sinds vele jaren nauw met hem verbonden waren en hem tot Emir van de gelovigen en Leider van de Afrikaanse staatshoofden hadden gekozen. Hier volgt een vertaling van de boodschap die in de video gericht wordt aan alle Libische stammen. Jullie hebben enorme verliezen geleden vanwege deze valse revolutie, die van de huurlingen van de NATO. Mijn Libische en andere Afrikaanse Toeareg-broeders, jullie hadden de nu gestorven Kadhafi als jullie leider gekozen, en we weten dat bij de Toearegs iedereen in actie komt als een van hun leiders vermoord wordt, om de daders van die moord te straffen. Beste Toeareg broeders, jullie leider is vermoord door de hand van mensen die noch Allah kennen noch zijn profeet en die gruwelijkheden plegen van de zelfde soort als die die de Joden plegen. Nu jullie hebben gezien hoe het lichaam van jullie leider door zijn moordenaars is mishandeld, is het tijd om op te treden. Wij weten dat jullie de huurlingen als vijanden beschouwen en het is jullie zaak om te beslissen over het lot van de daders (van de moord) onder die huurlingen en kolonisatoren. Beste Toeareg-broeders uit Libië, Algerij, West-Sahara, Mali en Nigeria,- jullie hebben jullie leider vaak bezocht en jullie kennen zijn houding tegenover de Toearegs: jullie eerden hem door hem tot Emir van alle gelovigen te benoemen en tot koning van alle (Afrikaanse) leiders. Nu moeten wij het strijdsignaal geven en vastbesloten de stijd aangaan tegen de vijand om ze uit het land te verdrijven. Jullie grootvader Omar al Mukhtar is het voorbeeld dat jullie moeten volgen. The tomb of Gaddafi’s mother has been damaged the most. Geloof maar dat ook het buurland Algerije zich bedreigd voelt door de NATO van Eng-France-USA. Franklin Lamb bevindt zich nu in de Sahel, waar de overlevenden van de NATO-NTC-oorlog zich verzamelen. Saif el Islam en Mussa Ibrahim zijn ongedeerd, maar ze nemen nu wat rust om te herstellen van het verlies van familie en vrienden. Intussen vormen anderen een politieke partij, het Libya Liberation Front (LLF), die wil deelnemen aan de verkiezingen van 2012. Ze zijn goed georganiseerd en ook de Peoples Committees zijn zich aan het herstellen. Lamb heeft goede hoop dat de NATO deze oorlog om de Libische rijkdommen ten slotte zal verliezen! Als iemand dit artikel wil vertalen, dan publiceer ik het in zijn geheel! De NATO en al die regeringsleiders die hem eerst zo bejubelt hebben ,krijgen nog eens een keer het deksel op hun neus . US-NATO Killing of Libyan Civilians Escalates: 28 april! @mr. drs. BOU: Gadhaffi was het beste wat Libie had, nu krijgen ze al-Qaeda,moorden en sharia…Zonder hem was dat land een grote bende geweest. Many of the fighters that pushed Muammar Qaddafi from power have refused to stand down. 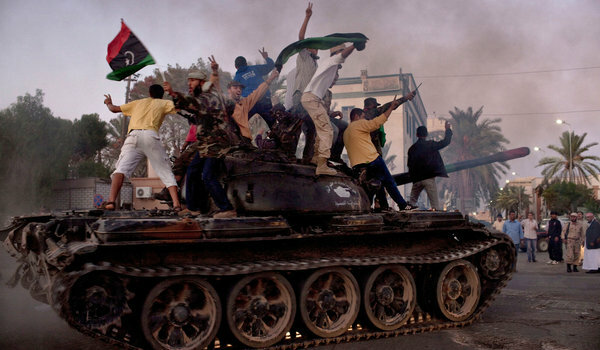 Now, some of Libya militias are allegedly stealing and targeting Qaddafi supporters for revenge. Libya dispatch: as lawlessness spreads, are the rebel ‘good guys’ turning bad? Once welcomed as liberators, Libya’s rebel fighters are beginning to outstay their welcome in Tripoli. Gaat over de jacht op negers, waarbij vooral de voormalige inwoners van de totaal verwoeste stad Tawargha (ongeveer 30.000 inwoners) het moeten ontgelden. De spreker is Mahdi Darius Nazemroaya! Dat is een goed idee, maar het is natuurlijk niet alleen van Bommel. Het probleem van alle politieke partijen is dat ze bestaan uit politici, terwijl de bevolking voornamelijk bestaat uit normale mensen. Politici denken dat ze het beste voorhebben met de bevolking. Zij zouden ons representeren. Rare jongens en meiden, die een vette boterham verdienen met elkaar naar beneden halen, zodat ze zelf wat beter lijken. Politicus wordt je door reeds als puber lid te worden van een politieke partij en de wekelijkse debating-club van de jeugdafdeling te volgen. Dat is een cursus elkaar op een nette manier afbekken. Wie daar goed in is, komt op den duur op de kieslijst. Zonder dat kun je het wel schudden in de politiek. Omdat de stemming bij de verkiezingen geheim is, weet je nooit wie er voor je kiest. Alleen de aantallen tellen. Ze zitten dus allemaal het beste voor te hebben met mensen die ze niet eens kennen. Beste Zwembad, misschien kun je mensen ook wijzen op het Groene Boek van Gaddafi. Zelden heb ik zo’n heldere uitleg gelezen van wat er mis is met onze parlementaire monarchie! alleen de praktijk van de rechtstreekse democratie (die ik aanhang) bleek vaak tegen te vallen in Libië. Kadaffi was geen heilige . Maar in vergelijking met de boeven in omringende landen nog te doen . De levensstandaard in Libië was niet voor niks zo hoog . In verhouding zelfs beter dan in Nederland als je kijkt naar de armoegrens. Maar de theorie en de praktijk van het groene boekjes waren niet altijd in overeenstemming . Waar het mij met de Partij-bash om gaat om al vast informatie te verzamelen die ik mensen later als er verkiezingen komen eens onder de neus kan wrijven . Zie even de opvattingen over Democratie bij die partij die volgens mij tegenwoordig geldt voor de meeste partijen . Zijn deze ‘Democraten’ nu helemaal van de pot gerukt? Politici zijn nu eenmaal zo. We zouden ze allemaal moeten opheffen! En wat het Groene Boek van Gaddafi aangaat: het staat vol goede ideeën, maar de praktijk blijkt altijd weerbarstig. Toch lijkt het me niet voor niets dat de NATO om Gaddafi uit te schakelen de hele infrastructuur heeft platgegooid. Scholen, ziekenhuizen, water, elektriciteit, huizen, wegen, voedselvoorraden, alles moest weg. Maar van de Jamahiriya zijn ze nog steeds niet verlost. Enige remedie: de hele bevolking uitroeien. Maar dat staat zo slordig voor een tiran die heerst in naam van Vrijheid en Democratie! Als wij ooit een echte democratie willen, dan zullen we de Jamahiriya moeten invoeren. Een oudere voorstander van dit idee was de Nederlander Anton Pannekoek (zelf even Googelen). Hij noemde het Radencommunisme, maar ik noem het Radendemocratie. Ja ik heb de laatste tijd ook erg verdiept in rechtstreekse democratie . Met name vanuit historisch perspectief over de atheense ; die echt (afgezien van de slaven en vrouwenverhaal) echt rechtstreeks was . Het ging in athene zelfs zo ver dat ze de noodzakelijke gekozen mensen (zoals legeraanvoerders – die moesten nu eenmaal verstand van oorlog hebben) zagen als een ondemocratische noodzakelijkheid . De Atheners van toen zouden onze democratie in de verste verte geen democratie genoemd hebben . Wat verder heel mooi is van de Atheense democratie is dat belangenverstrengeling strafbaar was (geseling zelfs) en dat de belanghebbende partijen niet mochten meestemmen . Stel je voor dat mensen hun eigen lot zouden willen bepalen?! (That we’re in the right) That the pain never! The media succumbs and opposes a thaw! And the injured learn that the pain will never! So, by July 31st, the northern demons had spent $1.5 BILLION DOLLARS on their aggression against Libya. This is what Libya was up against. Yet, miraculously, the Libyan Defense Force and the Libyan Jamahiriya volunteers held their own for 8 solid months. Detention and Torture of Dr. Dorda!